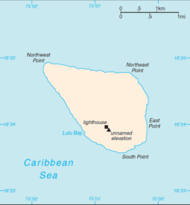 Navassa Island is an uninhabited island in the Caribbean that is administered by the Fish and Wildlife Service of the Department of the Interior of the United States of America as a National Wildlife Refuge. The island is also claimed by Haiti. It lies about one-fourth of the way from Haiti to Jamaica. Located at 18 deg 25' N, 75 deg 02' W, 160 km south of the U.S. Naval Base at Guantanamo Bay, Cuba, the island has a land area of 5.2 sq km consisting is mostly exposed coral and limestone rock. It is flat to undulating with a unnamed raised plateau on the southwest side. At 77m high this is the highest point. It is ringed by vertical white cliffs that are typically 9 to 15m high and has a 8 km coastline. The island has marine, tropical climate and has enough grassland to support goat herds as well as dense stands of fig-like trees and scattered cactus. This uninhabited island was claimed by the U.S. in 1857 for its guano, and mining took place between 1865 and 1898. A 46-meter-tall lighthouse was built in 1917, on the southern side of the island. The Coast Guard ceased operations and maintenance of Navassa Island Light in September 1996. After the lighthouse was shut down administration of Navassa Island transferred from the Coast Guard to the Department of the Interior. A 1998 scientific expedition to the island described it as a unique preserve of Caribbean biodiversity; the following year it became a National Wildlife Refuge. The island is considered an unincorporated territory of the US that is administered from Washington, DC, by the U.S. Fish and Wildlife Service, U.S. Department of the Interior. There has also been a private claim advanced against the island. Entry into Navassa Island is heavily restricted, and requires a special-use permit to visit, often from the U.S. Military or the US Fish and Wildlife Services. This even applies to U.S. and American Samoan citizens. There is no airstrip on the island. There are no harbours and an offshore anchorage is the only option. There is no economic activity on Navassa Island. Although the island is uninhabited, transient Haitian fishermen and others have been known to camp on the island. The laws of the U.S. apply. This page was last edited on 18 July 2015, at 04:03.